Canadian rocker Neil Young began his Honour the Treaties tour Sunday and it set off a war of words. 4 concerts to fund First Nations legal fight against oilsands projectsCanadian rocker Neil Young blasted the Canadian government, saying it's "completely out of control" when it come to the environment and oilsands expansion, as he kicked off his Honour the Treaties tour in Toronto on Sunday. The singer, speaking to reporters before his Massey Hall concert, said he supports First Nations in their fight against expanding oilsands projects in Alberta because of their destructive impact on the environment. "I see a government completely out of control, and money is number one. Integrity isn't even on the map," he said. Young said he toured one of 50 oilsands sites with his son and was shocked at "the ugliest thing I've ever seen. It`s the greediest, most destructive and most disrespectful demonstration of something that has run amok." "The resource sector creates economic opportunities and employs tens of thousands of Canadians in high-wage jobs, contributing to a standard of living that is envied around the world and helping fund programs and services Canadians rely on," Prime Minister Stephen Harper's spokesman, Jason MacDonald, told QMI Agency. By John R. KennedyIn the PMO’s statement, issued on Sunday after Young held a press conference in Toronto, a spokesperson said the federal government has defended Canada’s natural resource sector as a fundamental part of the country’s economy. By David P. BallUndeterred by Prime Minister Stephen Harper's rebuke that Neil Young's “rock star” lifestyle made him unfit to criticize Canada's oil sands, at his Toronto concert on Sunday night the legendary Canadian musician substituted Harper's name into his song 'Pocahontas,' which describes massacres against Indigenous Peoples. “Stephen Harper, Pocahontas and me,” the 68-year-old singer crooned to 2,700 fans in Toronto at the first show of his fundraising tour to support Athabasca Chipewyan First Nation's legal battle to halt the oil sands' expansion, which they argue has caused cancer rates to skyrocket and contaminated their lands and waters. In the street outside Massey Hall, dozens held a round dance--a fixture of the Idle No More movement that has swept the country over the past year. Only hours earlier, the Canadian music veteran issued his strongest words yet against his country's energy boom. He cited the statistic that oil sands-affected aboriginal communities have a cancer rate that is 30 percent higher than the rest of the population, including rare forms of the disease linked to petrochemical pollution. 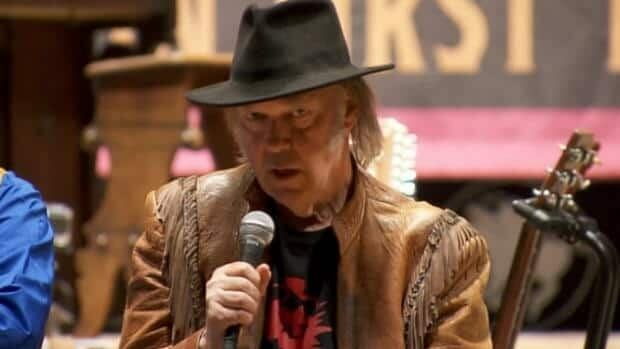 Petroleum producers says rock star's rhetoric is uninformed and divisiveThe oil industry is speaking out about negative comments made by rock star Neil Young during his benefit tour to help an Alberta First Nation. "Mr. Young may represent that rock stars don't need oil, but we would represent that Canadians very much do need oil," said David Collyer of the Canadian Association of Petroleum Producers (CAPP). He said the industry is proud of the positive relationships it has built with First Nations across Canada. "Certainly from time to time there are barriers to effective collaboration and engagement between industry and First Nations—we recognize that and we acknowledge it," said Collyer. He said those differences relate to education, culture, unresolved land claims and views regarding economic benefits and opportunities. "However, what Mr. Young and his colleagues fail to acknowledge is that in many causes, and in the face of those challenges, we've had many significant successes," said Collyer, pointing to jobs, contracts, cultural programs and infrastructure development. For more on the subject, see 4th Annual Tar Sands Healing Walk and Cameron Criticizes Oilsands "Curse." 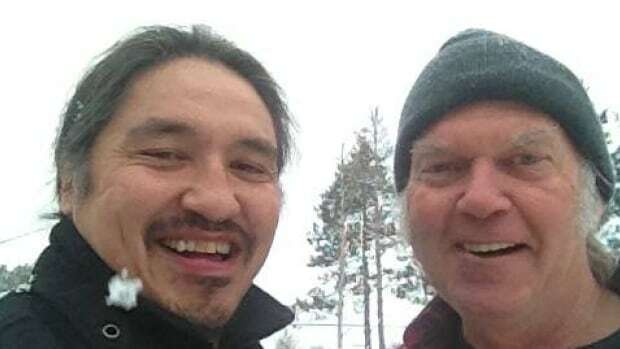 Below: "Chief Allan Adam, left, and Neil Young en route to Winnipeg during the Honour the Treaties tour. This picture was posted on Young's Facebook page, where he writes, 'Here's the Chief and yours truly outside Broken Canoe Trading Post. Big flurries fill the air. Honour the Treaties.'"